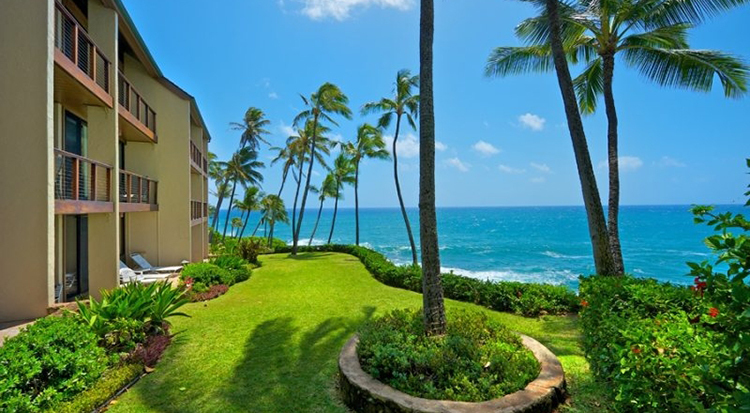 Poipu Makai is a small 15 unit, oceanfront condominium resort in the heart of Poipu. 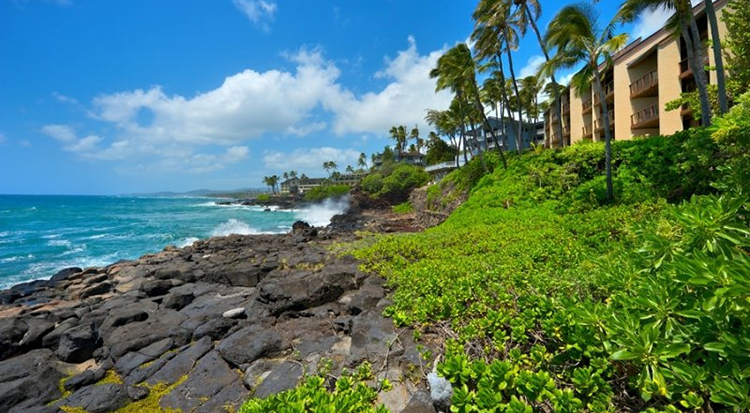 Located on the edge of a low bluff, this resort offers spectacular direct and shoreline ocean views. The grounds are landscaped with beautiful tropical foliage that provides a peaceful setting in which you can relax and enjoy your vacation. The resort has a small swimming pool for the kids and a gas barbecue area is also located on property. 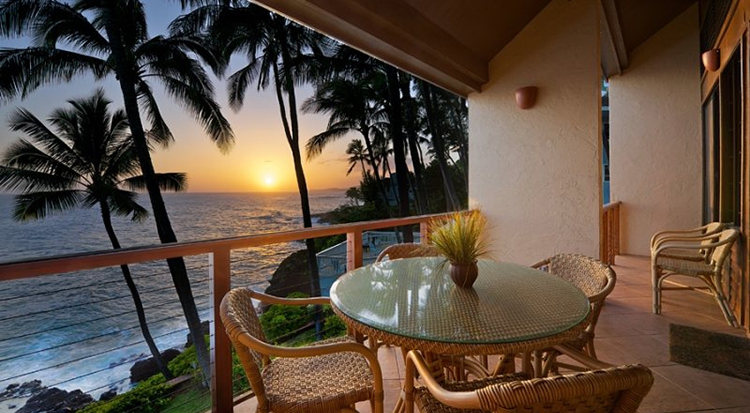 Turtles, dolphins and whales (seasonal) and unbelievable sunsets can be seen from the condo's full length private covered lanais. Three of Kauai's most famous beaches are within walking distance. Shipwreck Beach is a short walk to the east and Brennecke Beach, famous for boogie boarding, and Poipu Beach Park (voted one of the best beaches of 2004 by Travel America) are on the west. You'll find several fine restaurants in Poipu and many are within walking distance. You can even walk to the Grand Hyatt Hotel. The famous Poipu Bay Golf Course (the former site of the PGA Grand Slam of Golf Championship) is nearby as is the Kiahuna Golf Course - both designed by Robert Trent Jones. You'll find lots of shopping for gifts and souvenirs at Poipu Shopping Villages, Kukui'ula Village and in nearby Old Koloa Town. A top level end unit just a short flight of stairs from the upper parking lot, this 3 bedroom 2 bath condo has views all the way up the breathtaking Poipu coastline to Spouting Horn. On clear days, look beyond the crashing waves and you can see the Forbidden Island of Nihihau. Poipu Beach State Park, which is very family friendly with a children's playground, plenty of shade, picnic tables, and a protected beach on one side no more than 3 feet deep. The bathrooms are clean, and there is a freshwater shower to rinse off. Here you can relax on a crescent shaped beach, snorkel with the kids or grab a great shave ice at the beach side deli where you can also get a nice lunch, grab some sunscreen of refresh yourself with a cold drink. Next door to the deli is a surf and boogie board shop where you can find all your boogie board supplies, and surf gear. The sunset from here is picturesque and most days protected green sea turtles or a rare Monk Seal will stop by to visit. Brennecke's Beach, just a few steps from Poipu Beach, is where all the boogie boarding action can be found. It has waves that travel to the beach, from the beach, and right to left - sometimes all at the same time which can make for a great ride! Get here early for a good spot. Shipwreck Beach is located a 10 minute walk from Poipu Beach, and has some amazing views. The beach is in front of the Hyatt hotel, which is great for a thirst quenching Mai Tai! This wide sandy beach is never too crowded and is perfect for sunbathing but this beach is not swimmable.